The context around this verse is Peter talking about salvation. In verses 4-5 he mentions our "priceless inheritance that is kept in heaven". But did you get that?! Be TRULY glad. 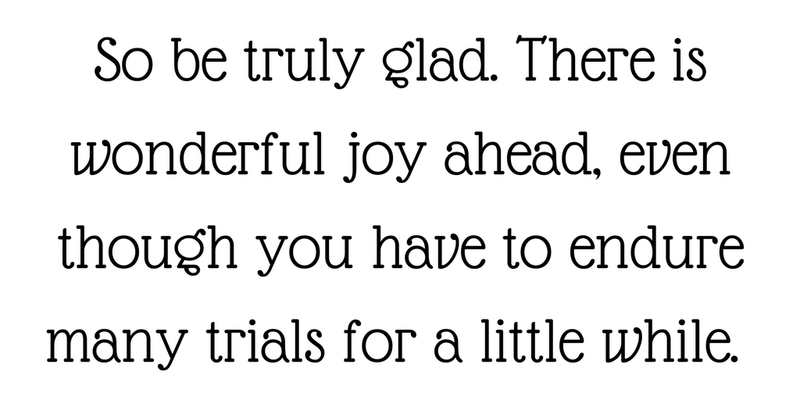 There is WONDERFUL JOY ahead (salvation), even though you have to endure MANY TRIALS for a LITTLE WHILE. The trials of this life are but a blip in eternity, aren't they? Easy to forget when they feel so overwhelming, or like they are going on forever (hello, foster care). But God wants us to focus our eyes and hearts on eternity. That is the true gift, isn't it? If all of the things I am momentarily stressed out about end up well and in my favor, that still won't be enough to give me true joy. Jesus is the only One that can make me truly glad. So as I am spending time thinking about all of this, I am realizing how important it is to not just be wishing the trials were over, and looking forward to when this is all said and done, but to actually be living in this moment, however hard it is. To be bringing glory to God with my actions and how I handle these situations, and where I place my joy and gladness. Verse 7 goes on to say, "So when your faith remains strong through many trials, it will bring you much praise and glory and honor on the day when Jesus Christ is revealed to the whole world." Later, Peter goes on to write, "So think clearly and exercise self-control. Look forward to the gracious salvation that will come to you when Jesus Christ is revealed to the world. So you must live as God's obedient children. Don't slip back into your old ways of living to satisfy your own desires. You didn't know any better then. But now you must be holy in everything you do, just as God who chose you is holy. For the scriptures say, "You must be holy because I am holy." (1 Peter 1:13-16 emphasis added) How often am I holy amidst trials? But there he says, in everything you do. Not just when things are going well. Not "be holy when it's convenient for you". But be holy in EVERYTHING. Why? Because GOD is holy and we are to be His obedient children. Whew. That is convicting. I don't have to like my trials. I don't have to be glad that I am stressed out and going through these things, but I am called to be holy in Christ likeness, no matter what my circumstances are. I can be so shortsighted some times, not thinking about the glorious day when Christ is revealed. It is so easy for me to fully envelope myself in stress and hard ships, not focusing my heart on eternity and spending forever with my savior. 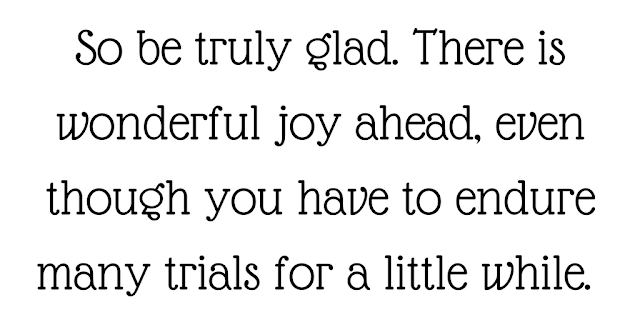 I am thankful for that reminder today, and for the reminder that I don't have to wait until my trials are over to glorify God. I can do that every day with the way I handle things, and with where I fix my eyes.